An African invasion has repercussion in Australia, writes Ben Cubby. Almost every time Australians sit down at the dinner table, they are eating the fruits of Morocco's illegal invasion of Western Sahara. This unlikely connection exists because of phosphate, which is imported from occupied Western Sahara by three Australian companies and added to superphosphate fertiliser. Most fertilisers used to farm vegetables, cereals and fruit contain phosphate mined in a region of Western Sahara occupied since a United Nations ceasefire agreement in 1991, which was partly policed by Australian troops. The United Nations has not imposed sanctions but has condemned the trade, while some overseas companies have imposed boycotts. Incitec Pivot, Impact Fertiliser and CSBP, which is owned by Australia's biggest retail company, Wesfarmers, which also owns Coles supermarkets, are among the world's most enthusiastic buyers of phosphate from Western Sahara, and dominate the Australian fertiliser market. The trade has quietly continued for more than a decade, despite claims from exiled Western Saharans and their supporters that it supports an oppressive regime, and that Australian money helps to sustain the Moroccan occupation. Until it was elected last month, the Australian Labor Party had appeared to be against the phosphate trade as well. Federal Labor MPs have addressed rallies opposing phosphate imports along with ACTU officials. After the AWB scandal in 2005 Kevin Rudd, then Labor's foreign affairs spokesman, said he would be dumbfounded if the then Coalition government had allowed the phosphate trade to continue in breach of international law. Yet the new Federal Government told the Herald this week that the phosphate trade would continue. "While there are no United Nations Security Council sanctions prohibiting imports from Western Sahara or Morocco, Australian companies importing natural resources sourced from the Western Sahara should give close and proper consideration to international law and human rights considerations, " said a spokesman for the Foreign Minister, Stephen Smith. "Australia supports an early and durable political settlement in Western Sahara, and the efforts of the United Nations to find a solution to the dispute." The Government's position is a bitter disappointment to those still resisting the occupation. "Australia has ideals of giving people a fair go, but I'm not seeing it in practice," said Kamal Fadel, the Sydney representative of Polisario, the recognised Western Sahara government-in- exile. "When I go to the refugee camps they say, 'Australia is a good country. Why are they doing this?' I have nothing to tell them." Fadel, who is visiting Western Sahara's refugee camps near the Algerian border, said the phosphate trade gave the occupation legitimacy and gave millions of dollars to the Moroccan regime. Western Sahara inhabits a grey area in international law because, as the Federal Government points out, the UN Security Council has not imposed sanctions. 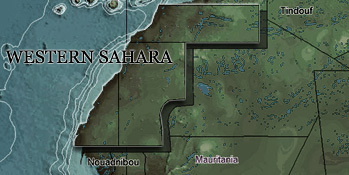 But it firmly opposes Morocco exploiting Western Sahara's few natural resources, mainly phosphate and fish. "In recognising the inalienable rights of the peoples of non-self-governing territories to the natural resources in their territories, the General Assembly has consistently condemned the exploitation and plundering of natural resources and any economic activities which are detrimental to the interests of the peoples of these territories and deprive them of their legitimate rights over their natural resource," the former UN under-secretary for legal affairs, Hans Corell, wrote in 2002 in relation to the Western Sahara occupation. The UN's legal position has not changed. The Australian fertiliser companies importing phosphate are aware of the UN position, but say they will continue to buy phosphate until the Department of Foreign Affairs warns otherwise. "Incitec Pivot is aware of the complexity issues involved in the importation from a Moroccan supplier of phosphate rock mined in Western Sahara," the country's biggest phosphate importer said in a statement. "The company has maintained dialogue with key stakeholders, including representatives of the Western Sahara Polisario Front, the Australian Western Sahara Association and trade unions in both Western Sahara and Australia." Incitec Pivot, which unloads phosphate at Newcastle, Geelong and Portland in Victoria, said it was satisfied that it was not breaching international law, and there was pressure on global supplies of phosphate, meaning Western Sahara was crucial to fertiliser supply. Ian Hansen, the managing director of CSBP, said the company was examining technology that would allow phosphate to be extracted from other sources. "When this work is complete CSBP will consider its broader social responsibilities to its employees and the farming community as part of any decision," Hansen said in a statement. Meanwhile, the ships continue to load at the Western Sahara capital, Laayoune. The phosphate rock is transported down the world's longest conveyor belt from the inland mining town of Boucraa. Hundreds of tonnes were received this month at Geelong, and further shipments are expected next month. "This has been going on under everyone's noses for long enough. There are other ways of getting phosphate," said Catherine Lewis, a spokeswoman for the Western Sahara Association of Australia. "The food on every Australian's table is fertilised by this stuff, so I believe this issue effects everyone in their daily lives."